Edmonton has cold winters. In January, for instance, the average daily lows are−10.4 °C (13.3 °F). What are 8 tips for winterizing your home? 8) Have an HVAC professional inspect your furnace, giving it a tune-up if needed. Have the inspector check the blower operation, gas piping, air filter(s), motor and fan. The HVAC guy should also inspect and clean heating ducts, sealing any unwanted leaks. Replace your furnace filter regularly, too. 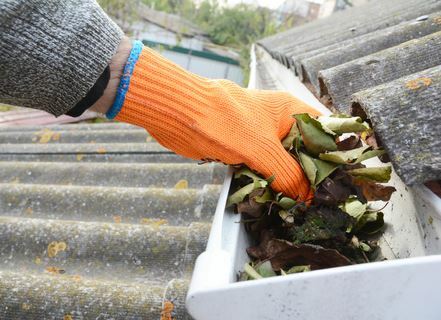 7) Clean the gutters so they’re clear of debris that would cause them to “back up” and not function well this winter. Meanwhile, if there are any trees whose branches are getting too close to the house, trim them down. 6) There’s a switch on ceiling fans. By moving this switch, you can reverse the direction of the blades. When it’s going clockwise, it’ll push warm air down– do this for the winter to keep the house warm and then switch it back in April or May to cool the place. 5) Got air leaks? Most homes do. Use some draft protectors on windows and doors. You can install weather stripping and/or caulk open areas to prevent your warm air from escaping/cold air from coming in. You’ll also want to check for leaks wherever pipes/wires exit your home’s foundation and seal them properly. If you have storm doors and windows, these can increase your home’s energy efficiency by 45%. 4) Add more insulation to your attic/walls. You can also wrap pipes with insulation to prevent them from freezing up. 3) Gather all the supplies you might need if the power was to go off unexpectedly. Make a bag of these supplies that’s easily accessible. Some things to pack: flashlight/lantern, batteries, matches, food/water… just in case. 2) If you have a chimney, when’s the last time a professional came over and inspected it? Before you start a fire in the fireplace this winter season, it makes sense to have a chimney inspector give you the “a-okay” to use it without worries. 1) Stop the water from running to outdoor faucets. Drain them out so there’s no water left to mess with the pipes should it freeze.